The public continues to express at least some confidence that Robert Mueller will conduct a fair investigation into Russia’s involvement in the 2016 election. A majority of Americans (61%) say they are very or somewhat confident Mueller will conduct a fair investigation; these views have changed only modestly since December. While opinions about Mueller’s probe – and other issues related to Russia’s alleged election meddling – are divided along partisan lines, nearly half of Republicans and Republican-leaning independents (46%) are very or somewhat confident Mueller will conduct a fair investigation. 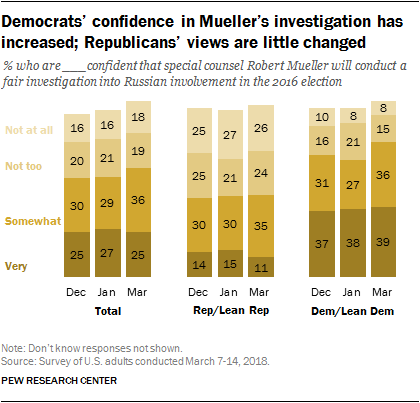 Democrats and Democratic leaners are overwhelmingly confident Mueller’s investigation will be fair (75% very or somewhat confident). About four-in-ten Americans (42%) are very or somewhat confident that the administration will make a serious effort to thwart Russian efforts to influence future elections. 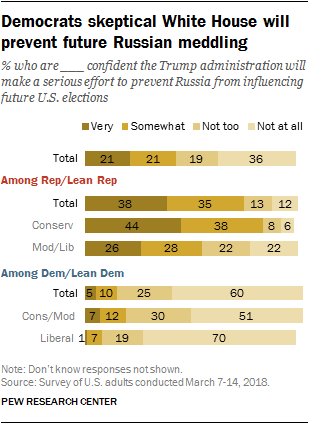 Most are not too confident (19%) or not at all confident (36%) the Trump administration will take serious action to prevent Russia from influencing future elections in this country. The survey finds that the public is divided in opinions about the ultimate impact of Russian efforts to influence the 2016 presidential election: 48% say these efforts did not benefit either Trump or Hillary Clinton, while 43% say they benefited Trump. Very few Americans (4%) think Russian actions benefited Clinton. 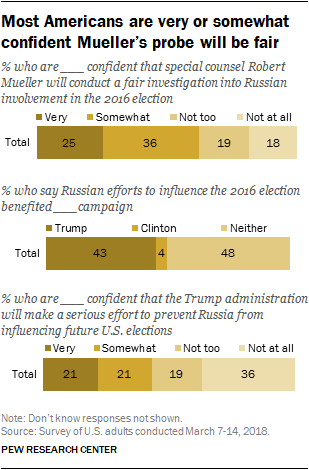 Overall, more Americans (61%) say they are very or somewhat confident that Justice Department special counsel Robert Mueller will conduct a fair investigation into Russia’s involvement in the 2016 election; 37% are not too confident or not at all confident that he will do this. Among Democrats and Democratic-leaning independents, 39% are very confident Mueller will pursue a fair investigation, while another 36% are somewhat confident. Just 23% of Democrats are not too confident or not at all confident. The share of Democrats who are at least somewhat confident Mueller will conduct a fair investigation into Russia’s election involvement has risen modestly since December, from 68% then to 75% today. By contrast, opinions among Republicans and Republican leaners are virtually unchanged from three months ago. About a quarter of Republicans say they are not at all confident (26%) that Mueller will conduct a fair investigation; 24% are not too confident, while 46% say they are at least somewhat confident Mueller will conduct a fair investigation into Russian election involvement. The public is split on whether Russian efforts to influence the 2016 election benefited Donald Trump’s campaign or neither campaign very much. Roughly equal shares say that Russian efforts likely benefited Trump’s campaign (43%) or neither of the campaigns (48%) – with sharp divisions by party. Just 4% say Russian efforts benefited Hillary Clinton’s campaign. 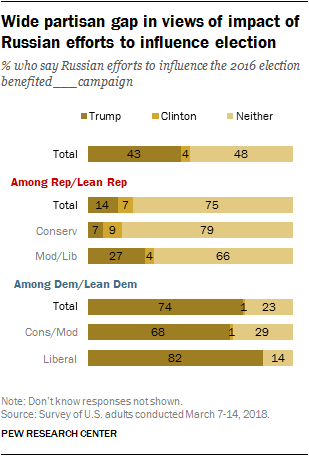 Three-quarters of Republicans and Republican leaners say that Russia’s meddling didn’t benefit either campaign very much. A nearly identical share of Democrats and Democratic leaners (74%) say it benefited Trump’s campaign. There are ideological differences in both parties in these views. Over a quarter (27%) of moderate and liberal Republicans say the Trump campaign benefited from Russian influence in the campaign, compared with just 7% of conservative Republicans. Among Democrats, majorities of liberals (82%) and conservatives and moderates (68%) say the Trump campaign benefited from Russian efforts to influence the 2016 election. There also are sizable differences between parties – and wide ideological differences within each – on whether the Trump administration had improper contact with Russia during the 2016 campaign. Overall, 58% of the public say senior members of the Trump administration likely had improper contact with Russia during the 2016 campaign, including 25% who say they “definitely” did and 33% who say they “probably” did. As with views of Mueller’s investigation, these opinions are relatively unchanged since December. An overwhelming share of Democrats (88%) says that improper contact probably (45%) or definitely (43%) occurred. Liberal Democrats (54%) are far more likely than conservative and moderate Democrats (33%) to say such contacts definitely took place. By contrast, seven-in-ten Republicans (71%) say that senior members of the Trump administration probably or definitely did not have improper contact with Russia. 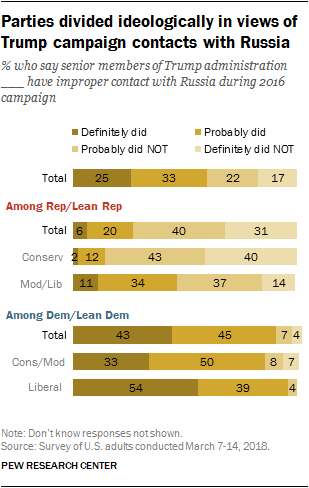 While 40% of conservative Republicans say improper campaign contacts between senior Trump officials and Russia definitely did not occur, just 14% of moderate and liberal Republicans say the same. A majority of Americans (56%) say they are not confident that the Trump administration will make a serious effort to prevent Russia from influencing future U.S. elections. Roughly four-in-ten (42%) say they are very or somewhat confident that the administration will take serious action in this regard. Democrats – especially liberals – are deeply skeptical that the White House will make serious efforts to block Russia from intervening in future elections. A large majority of liberal Democrats (70%), along with about half (51%) of the party’s conservatives and moderates, say they are “not at all confident” the administration will make serious efforts. Most Republicans (73%) are very or somewhat confident that the administration will make a serious effort to block future election involvement by Russia. However, just 38% are very confident the White House will take serious action, including 44% of conservatives and 26% of moderates and liberals.